The Tactical Solutions 10/22 Extended Magazine Release is new for 2007. The release extends under the trigger guard making it possible to drop the magazine with the shooting hand. 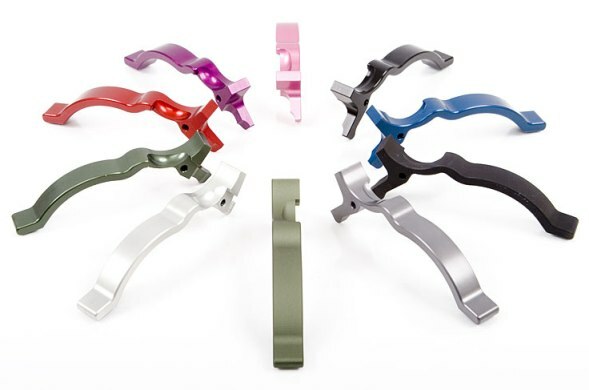 They are made from anodized aluminum and are avaiable in the same colors to match Tactical Solution's 10/22 barrels. The releases are available in either Black, Matte Black, Gray, Blue, Matte Green, Red, Purple, or Silver finish. Great product! It assembled in minutes and with my thumbhole grip it works without letting go of the grip. It is very sloppy when magazine is installed in place. No problem with the magazine falling out prematurely but annoying thats all. Would recommend this product to all 10/22 enthusiasts. Got this on friday just in time for a match on Sunday. The release installed in a minute. No problem whatsoever.Fit well with no looseness. At the match the magazine just fell into my hand when the release was activated. Outstanding product. Super easy to install...even easier to remove your mags. I really like that this magazine release extends down so far along most of the trigger guard. My stock has a verticle grip, which is nice because I can release the magazine without taking my hand off the grip. I think it offers good asthetics as well. What I was not pleased with is how loose and sloppy the release is when the magazine is in place. The hole for the pin is too large, and there is too much play between the trigger housing, magazine release and bolt release. Consequently the release floats A LOT with the magazine in place. I used a combination shim washers to take out 0.048" between these parts! After doing so, the release fit much better. It would be better still if they didn't machine the pin hole so large... I would not discourage anyone from buying this that didn't have the patience to shim it as I did. Otherwise its great, as is the price and customer support that Rimfire Sports offers! Easy to install and makes swapping out clips easier and faster! Thanks rimfire sports and custom! Yall helped me build my dream rifle! Customer for life!